Our buddies and the campers are the heart of Camp Hope. Camp Hope is unique in that it provides one-on-one care. A buddy is paired with a camper and takes sole responsibility of that individual. If you are a rising high school senior (at the time of camp) or college student, you are eligible to apply for a buddy position at Camp Hope. This is a full time opportunity monitoring the health needs and medications of our campers. The camp nurse resides on-site at camp from Sunday afternoon until Friday afternoon. A private room provided. Volunteers must have a current Illinois nursing license. If you are interested in being a on-site nurse for either session of camp, and for more information please contact Laura Fuhrman at lfuhrman@camphopeillinois.org. Volunteers are needed to help prepare, serve and clean up at meal times. Our kitchen is staffed with two permanent volunteers who reside at camp for the week. Volunteers can assist the kitchen staff throughout the day. First time volunteers welcome! To sign up or to learn more information please contact Laura Fuhrman at lfuhrman@camphopeillinois.org. Volunteers are needed to assist with unloading camp equipment from the storage locker and transporting the camp location. Trucks are provided. The majority of the activity includes moving playground equipment and other camp equipment from the storage facility onto the truck. Also includes assisting with camp set-up (1 ½ - 3 hr commitment). Volunteers are needed to assist with camp close up at the camp site on Friday to assist with packing and cleaning (2-3 hour commitment). To sign up or to learn more information please contact Laura Fuhrman at lfuhrman@camphopeillinois.org. 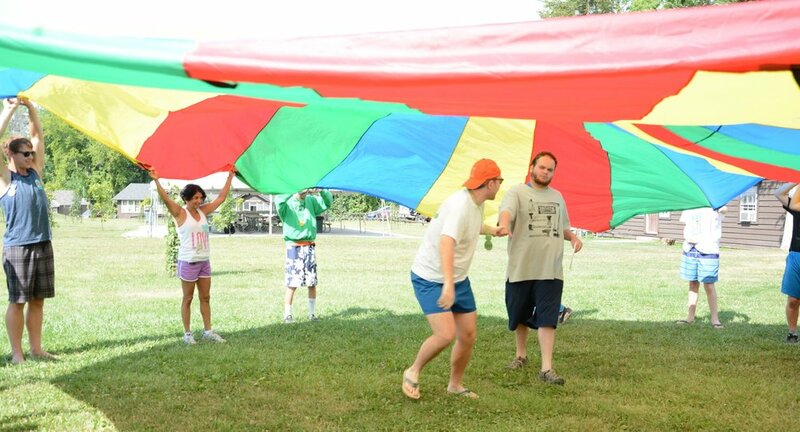 Volunteers are needed to coordinate or assist with PE, Arts & Crafts, Music, Carnival or other camp activities. Volunteers in this area will have group interaction with campers and buddies. Coordinators should have at least one year of camp experience, first time volunteers are welcome as assistants. 2 ½ hour commitment Monday – Thursday of camp. To sign up or to learn more information please contact Laura Fuhrman at lfuhrman@camphopeillinois.org. A camp photographer is needed to visit camp during throughout the week to take photos of Camp Hope in action! A camera is provided. To sign up or to learn more information please contact Laura Fuhrman at lfuhrman@camphopeillinois.org. Meal groups are wonderful ways to join with your family or friends to provide a meal during the week. Menus are developed by the kitchen staff and meal groups purchase, prepare and serve the assigned lunch or dinner. This opportunity works well for an organized group such as family, religious or civic organization of 4 to 6 persons. This volunteer opportunity includes the donation of the cost of the meal. First time volunteers are welcome! To sign up or to learn more information please contact Laura Fuhrman at lfuhrman@camphopeillinois.org.